Boston Solar is the #1 residential solar contractor based in Massachusetts, with more than 3,600 installations in 7 years. They are proud to power Massachusetts, a state that continues to lead the nation in solar installations. Boston Solar provides superior products, exceptional customer service, and the highest quality workmanship. 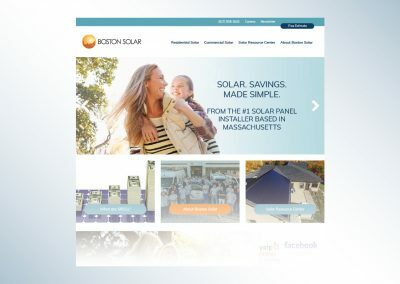 Like many companies, Boston Solar grew over the years, but had never really addressed their brand identity beyond having a logo. This led to a hodge podge effect that didn’t give their customers visual clues that the website, marketing and sales materials, booth materials, and social media were all coming from the same source. And the look definitely didn’t tell their story. By providing the visual framework, the internal staff was able to take that framework and create a full Boston Solar story.